The body count rises! Another Squad member falls – but not the way you might expect! Betrayal follows betrayal as Captain Boomerang joins the Squad in a smash-and-grab against the terrorist organization Kobra, and Harley Quinn shows why you should never, ever recruit Squad members from Arkham Asylum. Brace yourself for a last-page shocker the likes of which the Squad has never faced before! After Crisis on Infinite Earths, most of the Rogues faded from view as DC wanted to establish new villains for Wally West. 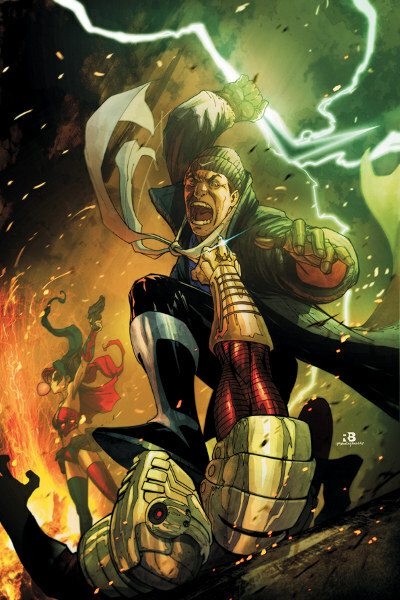 Captain Boomerang remained visible as a mainstay of the classic Suicide Squad. In fact, it was an issue of this series, not The Flash, that first really fleshed out Boomerang’s origin: Suicide Squad #44 expanded on the connection between “Digger” Harkness and toy manufacturer W.W. Wiggins, revealing him to be not simply a businessman hiring a mascot to promote his product, but a father reaching out to secretly help his long-lost son. I wouldn’t be surprised if that story partially inspired Brad Meltzer’s decision to use Boomerang in Identity Crisis. This entry was posted in Covers and tagged Captain Boomerang, Dan Panosian, Solicitations, Suicide Squad on September 17, 2011 by Kelson. Our series reacting to DC’s September relaunch is almost complete. So far we’ve covered the Justice League, Green Lantern, Batman, Dark and Teen books. This time around we’re looking at the “edge” series. This entry was posted in Opinion and tagged Blackhawks, Blue Beetle, Deathstroke, Group, Jonah Hex, New 52, OMAC, Relaunch, Sgt Rock, Stormwatch, Suicide Squad on June 12, 2011 by Greg Elias, Kelson, Lia and Devin.